Throughout the summer we have attempted to provide updates as to the extent of dicamba-injured soybean throughout the United States, either in the form of official dicamba-related cases that are currently under investigation by the state Departments of Agriculture, or as estimates of injured acreage from university extension weed scientists (see Ag Industry, Do we have a problem yet? and Update on Dicamba-related Injury Investigations and Estimates of Injured Soybean Acreage). In an attempt to bring some sort of "finality" to this issue for 2017, we requested this information one last time and have compiled this information into the figures below. 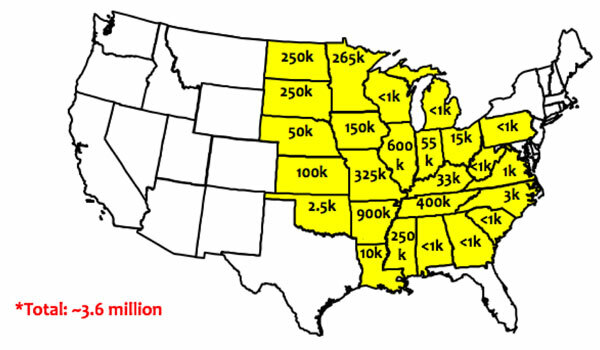 As shown in Figures 1 and 2, the (hopefully) final numbers indicate that there are 2,708 dicamba-related injury cases currently under investigation by various state departments of agriculture around the U.S., and that there were approximately 3.6 million acres of soybean that were injured by off-site movement of dicamba at some point during 2017. These numbers were up slightly from the August 10th report of 2,242 cases and approximately 3.1 million soybean acres, primarily due to the changes that occurred in some of the northern states like Minnesota, North Dakota, and South Dakota. As I'm sure everyone who is familiar with this issue is well aware of by now, several weeks ago the EPA issued new labels for XtendiMax, Engenia, and FeXapan with tighter use restrictions. At this point, many state departments of agriculture are deciding whether or not they will impose any additional state requirements for the use of these products. Needless to say, there is much more that will be discussed on these issues and many more decisions that will be made in the coming weeks and months. Stay tuned. Figure 1. Official dicamba-related injury investigations as reported by state departments of agriculture (as of October 15, 2017). Figure 2. 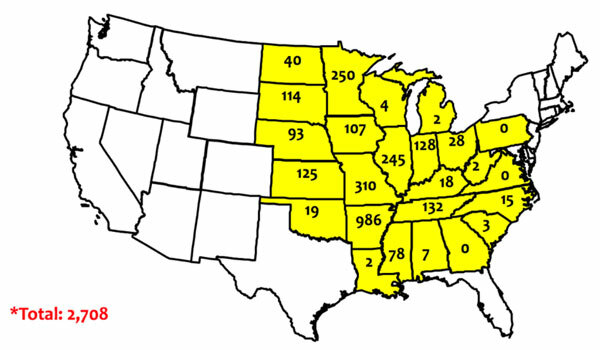 Estimates of dicamba-injured soybean acreage as reported by state extension weed scientists (as of October 15, 2017).